Critics say Virginia lags behind neighboring states in the development of wind and solar power, in part because lawmakers are influenced by two monopolies – Dominion and Appalachian Power. It’s more profitable for them to stay with fossil fuels and nuclear power, and the state requires them to keep prices down, but supporters of renewable energy say lawmakers are coming around. Sandy Hausman has part four in the series. Tony Smith is a Staunton businessman who’s been trying to sell Virginia on solar energy since 2009. But government policies here don’t promote solar development , so Smith has spent the last few years lobbying for change. He got a positive reception from Alonzo Lopez , a delegate representing South Arlington and Eastern Fairfax. In the last session, he was one of the few lawmakers who succeeded in getting green energy legislation passed -- a bill that requires Dominion to buy new renewable energy credits every five years. Those credits allow Dominion to market a program in which customers pay more to assure that their energy dollars are not spent burning coal or gas. State lawmakers also voted to exempt solar panels from the machine tool tax. 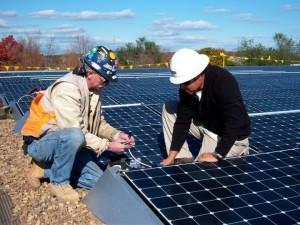 That will make solar investment more profitable, and supporters say it will create jobs. Likewise, backers of wind energy say it’s time for the state to recognize the economic benefits of a green energy revolution. The Sierra Club’s Glen Besa cites the potential of wind farms off the coast. Finally, public demand is growing, along with concern about climate change. Once a passion of left-leaning environmentalists, wind and solar are now favored across the political spectrum. Tony Clifford is past president of a solar organization representing Virginia, Maryland and Washington, DC. In our final report, we’ll visit a community where 40% of households have solar panels on their roofs, and wind turbines generate 500% of local electrical needs. In 2013, the Solar Energy Industries Association says installations were up 41% nationwide, with North Carolina ranking third for installed solar capacity and Maryland 16th, but neighboring Virginia was far down the list at number 26. Thirty states, including West Virginia, Maryland and Pennsylvania, have land-based wind farms, but Virginia has none. Virginia is blessed with wind – in the mountains and along its shores, so you might expect this state to jump quickly into the business of generating electricity from turbines. Likewise, there’s plenty of sunshine, but Dominion Virginia Power’s preferred plan for 2027 shows just four percent of our electricity coming from renewable sources. Appalachian Power will be at 9% by 2020, but most of that energy will come from existing hydro-electric dams. Despite concerns about climate change, Virginia’s largest electric utility still generates more than half of its electricity from fossil fuels, and by 2027 Dominion Power expects to get nearly 60% of its power from coal and gas. The state’s other electric utility, Appalachian Power, is also big on carbon-based fuel. By 2020, parent company AEP says 79% of its power will come from burning coal and gas. It’s been sixty years since the first solar panel was developed by Bell Laboratories, and more than twenty years since the first solar plant began feeding power into the grid in California, but here in Virginia there are fewer than a thousand households producing and selling electricity back to Dominion Power. Wind turbines are also rare, but reports that could change quickly if government and the public got on board.